Rick’s on the rocks, glass in hand – watching. Wake at six in a strange mood. Ocean Nova is on GMT -2, we have been invited for breakfast before Rick’s talk. Too early for me, but Helen is perky and eager, so they depart at seven-fifteen, with instructions to sweep throughout. Buy the time I’m dressed and swept, visitors are here and I haven’t finished chopping breakfast fruit. Superb weather; passengers bask and ask if it’s always like this. Chicks already panting in the heat. Sheathbills provoking defensive hissing from the penguins. A cacophony of tweets from all over the island. 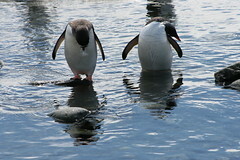 Since the snow cover has all but gone, the gentoos slide-surf down the steeper rocks – they must have reinforced soles – comical to watch. Nice cuppa on deck soaking up the warmth (and finishing delayed breakfast.) Helen is hungry for egg, so I whip them up scrambled for everybody, and we eat on our knees outside. Rick clears away snow and gubbins from back wall so that I can join Helen’s painting efforts (she’d do the whole thing single-hand edly otherwise.) Slap on the bitumen, don’t feel like singing, have to concentrate on not frowning, though I’m happy enough. Make it round past the back door and Helen overtakes to start on the middle gap, in between new and old genny sheds. Balancing on a stack of wood to reach the facia, I see great views of sparkling ice, blue skies, mountains, wisps of cloud. Suddenly notice a person atop the palatial berg over in Peltier Channel’s mouth. There’s an inflatable moored beneath it, several other figures appear, some ice-climbing. What a thing to do?! Carry on painting. There’s a sharp contrast between shadow and direct light. Helen goes to fetch ladder to do the strip we can’t reach. Precarious on uneven slope on soft snow. After covering a few more metres we need lunch and stop for fishy salads. I stay out, enjoying the air, and reflections, and think how it will be to look back on this. Rick joins me with tea. Euronav would like to visit. We make them wait forty-five minutes, for a decent break. Theirs are the voices I heard last night, and they were gallivanting on the big blue berg earlier. Finish painting in the middle, yachties arrive as I’m peeling out of overalls. Helen’s come over all tired, lay down to eat lunch then stayed there. Nice Belgian skipper Dixie, and crew appear, and start chatting to Rick and I – they had been in touch via e-mail over the last year. Notice that we’re being filmed. This team are tracing de Gerlache’s route; In The Wake of the Belgica. Funds have been raised by selling postcards at boaty exhibition/events, signed by all the crew, with a rubber stamp, the ink glows in the dark to illuminate voyage of the original explorers – cool. 300 to post from here (quite a few philatelic,) and 197 more stamps needed. We stick them all on. Rick chats about Alaska, dog racing and friends who’ve changed gender. Get down to franking once they’ve gone, and fill whole counter, and the lounge table. Brain ticks with future fund -raising plan for Port Lockroy. Helen is boiling stock for soup and restocks a few bits from the boatshed. Tinker so that shop is ready for Endeavour. Euronav have lent us a kayak! Wow. Work til all is done (relieved that we don’t need to wash floor. Rick finishes puttying new window panes in the science room. We eat hearty bowl of chicken broth. H and I dress up in waterproofs. Rick sees us off and kindly spots us all the way. So exciting to paddle off round the island, oars dripping globules on the sea’s surface for a second. pass Jougla Point and the yacht Esprit d’Equipe who’ve just come in this evening. Not too close to the cliffs. Stop and glide then spurt forward, alternating energetic bursts with pure relaxing. Think about Woogie Island, but that’s too far for tonight, slip over to express our thanks to the Belgians. Rick’s on the rocks, glass in hand, watching. Only half an hour but SO theraputic. Zinging. I’m starting to consider Rick’s daily waste management chore as penance for snoring. We hear an engine but see nothing.